This procedure offers effective treatment to naturally rejuvenate the skin, dramatically improve scars, and efficiently eliminate fine lines and wrinkles. As the applicator tip is applied to the skin, thousands of superficial micro-channels or holes are created. This process stimulates your skins natural ability to heal itself. The repair process begins almost immediately; as a result, new collagen and elastin produce softer, firmer skin. They reduce the appearance of wrinkles, acne scars and textural issues. The device works with tiny needles penetrate the epidermis and dermis in a very controlled, precise manner. These micro-injuries to the skin stimulate the body to produce new collagen and elastin – the support system of healthy skin. 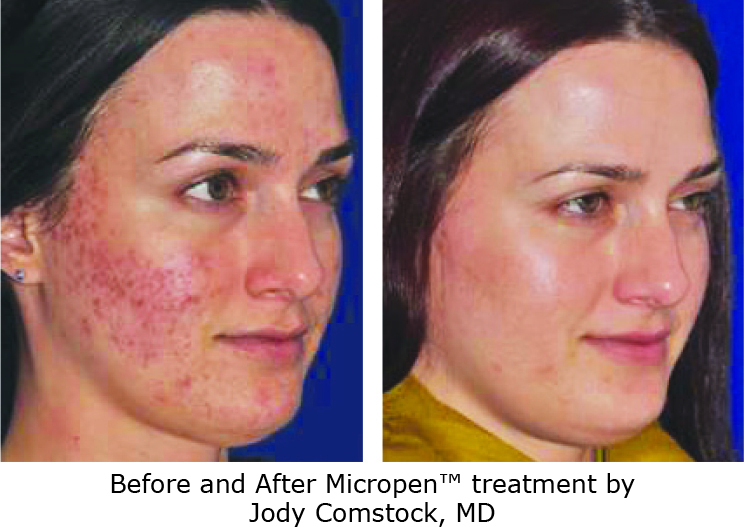 As the treated area heals, smoother, more even, healthier-looking skin appears. It can treat a variety of conditions including the following; fine lines, moderate wrinkles, scars from acne, surgery or injury, uneven skin tone or texture, stretch marks, premature aging from sun exposure and skin laxity. There is no downtime to recover from the procedure, but the treatment will result in redness that may take anywhere from 24 hours to 4 days to go away. Visible improvements to the treated area begin to appear over 1 to 3 weeks. Continued improvement may continue for up to 6 months following treatment. For optimal results, we usually perform 2 to 3 treatments at intervals of 2 to 4 weeks. More severe or advanced conditions, such as scars or deeper wrinkles, can require up to 8 sessions spaced anywhere from 2 to 6 weeks apart.